This has to be one of our favorite pieces to date! 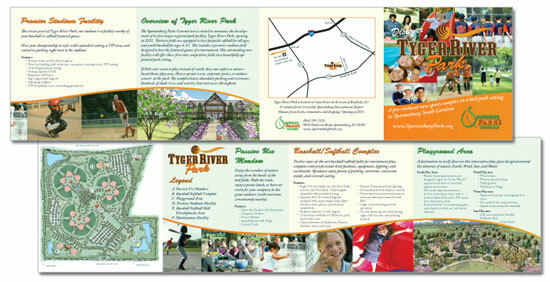 This brochure for the new Tyger River Park under construction in Spartanburg. The brochure folds three times into a 7 inch square. Pixel & Paper Designs also created a custom map to the Park’s location and coordinating business cards. Overseen by the Spartanburg Parks Commission, the park will offer a baseball/softball complex, a fabulous playground area designed around the elements of nature, and a meadow/picnic area for corporate events or just hanging out. You are currently browsing the Pixel & Paper Designs blog archives for October, 2009.